Class codes are often detailed and provide a verbose description of the technologies they pertain to, making them hard to decipher at first glance. To make things easier to understand, we curated the class codes along with other patent parameters, and defined specific technology categories. Let us see how this can help the patent analyst. Under Explore, a tag cloud of top technologies appears. Here, apart from identifying the top technology categories, you can refine your search based on these specific technologies. In a couple of clicks, you can select the desired technologies and subsequently refine the search results. You can plot graphs with technology category as one of the variables, for a detailed analysis and to view the statistics. These could then be exported and used for reporting purposes. 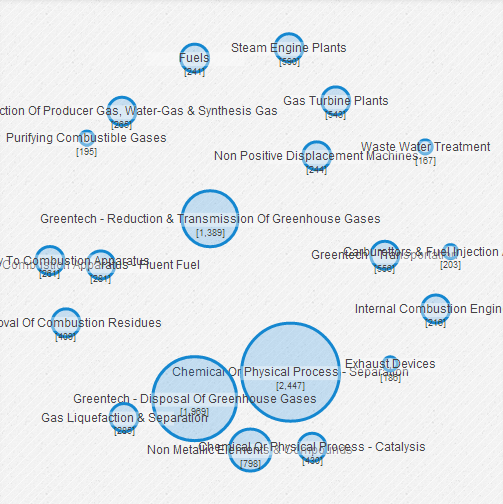 As is the case for Relecura’s Topic Maps displaying either the concepts or classification codes, the size of each bubble indicates the count for each Technology Category. In this example, you will notice that ‘Chemical or Physical Process – Separation’ and ‘Disposal of Greenhouse Gases’ are the top two Technology Categories in the result set. In addition, the proximity between the various categories indicate their relationship to each other. 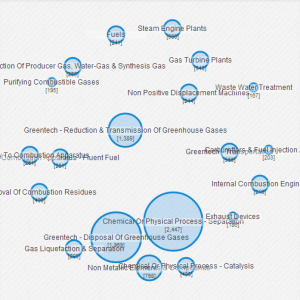 For example, ‘Disposal of Greenhouse Gases’ is more closely related to ‘Gas Liquefaction’ than ‘Purifying Combustible Gases.’ Since this map is interactive, you can also conveniently select and remove Technology Categories, and then refine your search results. Technology Categories can be used across several features of Relecura such as Topic Maps, Graphs, Explore, and Browse. If you would like to try this out yourself, please click here. In case you have some feedback, please leave us a comment on this post. « Proximity searching has arrived!